Photo courtesy of Eric Berg. Inbound traffic should avoid South Main Street, as it is being eaten. The half old chicken is on sale this week. Next time somebody says “Get a life”, you know where to go for a fresh one. How about “Frest & Delicious The Street life” It could be like an urban outfitters for the homeless. They’ve been salting the roads again. Their slushies are pretty good, but I’ve never seen the machine. Fresh road kill on the grill every day ! Looks like Delicious the Parking Lot too, just avoid the yellow patches. Must of the yellow snow eat you not. I have always lived in a tropical/subtropical climate. If it was that cold, they would have to have naked shop assistants, for me to do any effen shopping. 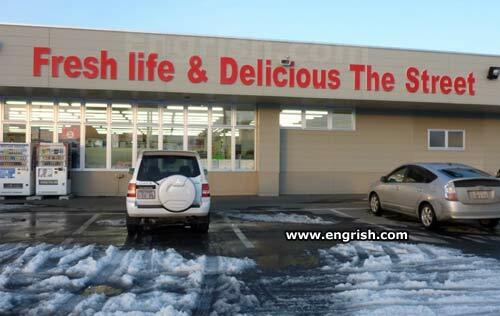 I preferred Fresh Life and Delicious The Movie. Fresh life and delicious the street… For life is eternal, and love is immortal and death….. is not so fresh and delicious. Many people tried to eat this street made of super hardened blackberry flavoured popsicles, but it all resulted in broken teeth on the ground. That ‘snow’ is the teeth. It’s a fresh life, but the street is delicious. Just watch yo’ back when you come up in this store. You can have an Icee, and (after he’s been run over) you can have the Icee bear too! Even funnier than the sign on the building is the caption regarding “We’s” supermarket (as opposed to “Our”). The street does look delicious with all the snow cones on top of it. The Street is delicious for the dust eaters.